At 37-inches tall, the Triptych indoor wall fountain brings a sense of the outdoors right into your living space. Through the combination of the slate and black finish, a textured modern look is achieved. The base of the fountain comes in black, featuring river stones that catch the water as it flows down the wall. The main water wall is comprised of slate, delivering natural colors reminiscent of a river side. Water flows down the wall, giving a soft sheen to the slate and delivering the relaxing sounds of running water.With clean lines and a contemporary feel, this wall fountain will fit right into a dark or neutral-toned living space. 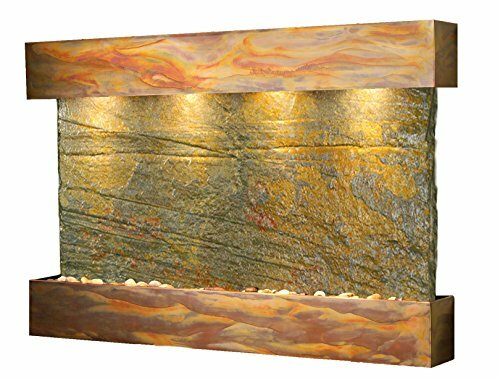 Able to be put on any kind of wall, this fountain can serve as a centerpiece on a highlight wall or as an accent piece for a side wall. Along with the relaxing sounds of water comes the added benefit of humidifying properties that help to keep dust down and your space a little less dry! These benefits can be added to your living or work space in a stylish and functional fountain. The Triptych indoor wall fountain will deliver plenty big on contemporary style! A stunning piece of natural slate is sandwiched between a base & top in a copper finish. The riverbed table or wall fountain brings together slate & copper into a stunning piece that will bring a little piece of your favorite natural River right into your home. Standing at 25" tall, this fountain will be right at home on a side table or on a wall in your living space. Highlighted by an LED light at the top, the water running down the slate face of the riverbed fountain will accentuate the beauty of the slate without adding distracting water splashing sounds to your space. The River stones sitting in the bottom help to carry the natural look down into the contemporary base, making for a versatile look! adding a table fountain to your home can help to keep your space humidified during dry weather, helping to keep your living space free of negative ions like dust! with the benefits of humidifying, relaxing sights & ambient light, the riverbed table or wall fountain will add a polished touch to your space. Coming in a natural slate & copper finish, the Stream indoor/outdoor fountain fuses natural elements with a clean, contemporary design for a stunning fountain. The rectangular base of the fountain comes in a warm copper, cradling river stones that water cascades over once it hits the bottom. The fountain stands at 33" tall, with a large slate wall that springs from the base. Water cascades down the wall, bringing out the striking color of the natural slate without the distracting splashing sound of some other fountains. This fountain would be perfect either placed on the side of a room or against a wall. It would be right at home placed in a workspace. Water can help one to relax & invoke creativity, which would be extremely helpful in a workspace where you’re working on the last tendrils of a project. Alternately, this fountain could be placed against an outdoor wall or flat surface. It would stand as a perfect centerpiece along a wall near your outdoor seating area, bringing the relaxing sounds of water to your space in a sleek, modern way. The Stave table fountain will be the rustic focal point of any space that you place it into. 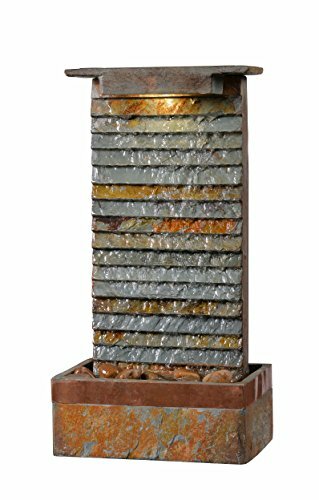 At 19-inches tall, this fountain features a mixed material finish of slate and copper. A rectangular base holds the water wall up, with natural stones catching the falling water once it reaches the bottom. The wall itself is comprised of overlaid pieces of slate that give a sense of depth and texture to the water feature. Water runs down from the rectangular top, carrying the sleek, modern look throughout the fountain. A light rests in the top, illuminating the running water with an eye-catching sheen.This fountain would bring a relaxing touch to a work space, whether you’re setting to work on paintings or hunkering down for a paper. Adding a table fountain to your home can also help to keep your space humidified during dry weather, helping to keep your living space free of negative ions like dust! Or if you’re looking for a sleek fountain to place atop a console table in your entryway, this fountain will bring the sound of running water right along with it. Alternately, your outdoor lounge space where you hang with friends for summer night bonfires could play host to this fountain on a side table for a touch of water outside! 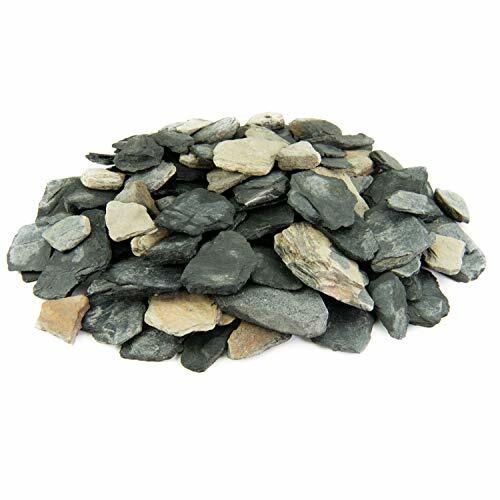 Our Black and Tan Slate Chippings make a tremendous contribution to any garden or landscape. Slate rocks will add contrast to any application and are as attractive as they are low-maintenance. Using them as a top dressing will help retain soil moisture and suppress weed growth, saving you precious time! Slate Chips are used in almost all garden styles and are extremely popular in aquariums, terrariums, fairy gardens, and much, much more! 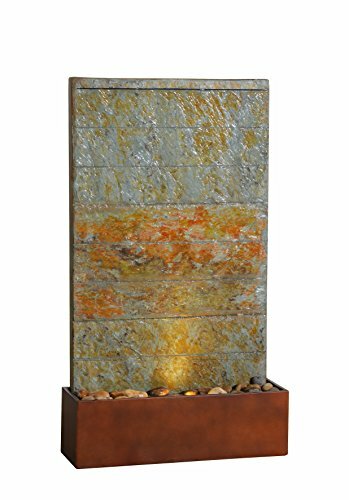 Blending the natural variation of slate with modern lines, the meander indoor/outdoor floor fountain is sure to be a focal point in any area. A rectangular base supports the water wall, with river stones resting in the bottom. The wall itself is made up of various strips of slate, that give a stacked look to the main feature of the fountain. A LED light is placed in the top of the fountain, pointing downwards to illuminate the fountain wall. Water runs down the wall, trickling over each piece of slate. At 48" tall, this wall fountain will bring a commanding presence to any space. with versatility in placement, this fountain can be placed on an outdoor patio. Next to a seating area, this fountain will bring plenty of relaxation & beauty into the space. If you’re looking for a water feature to place inside, this floor fountain will be equally at home in a modern, rustic or casual living space. Placed in the corner of or on the side of a comfy seating area, relaxing sounds & the benefit of humidifying properties that help to keep dust down will be right at your fingertips. The Reflection Creek Collection is made in the USA by Adagio Water Features. A comforting and tranquil environment is the natural result of combining soft halogen lighting over the gentle movement and sound of water in motion. 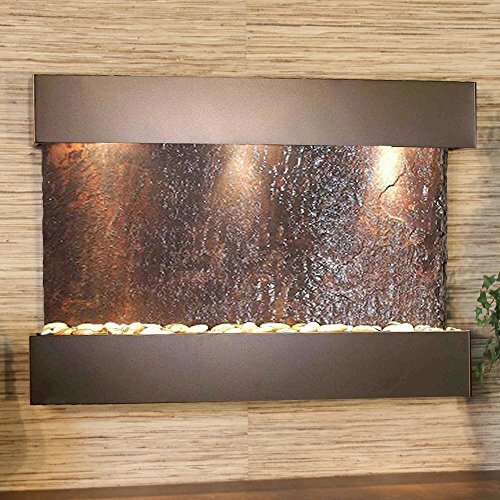 This horizontal water feature is available in six different Metal Frame finishes along with the choice of Silver Mirror, Bronze Mirror, or Natural Slate Faces. 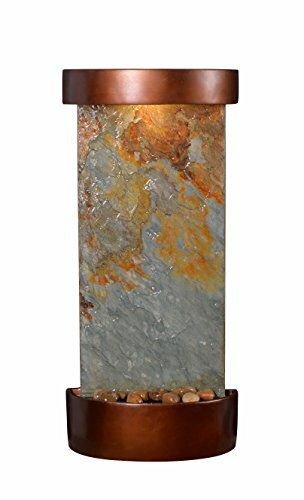 The Reflection Creek feature includes polished river rock, halogen lighting, and water pump. The heavy duty tray liners are double tested to ensure a water tight seal. The adjustable splash guard (pebble beach tray) prevents splashing, hides the pump from view, and displays our pebble beach made up of natural polished river rock. This beautiful water feature is the perfect size and compliment for any room in your home or office. These rustic floating shelves are made out of 100% reclaimed wood. We use old barn and fence wood to make this unique design. Each piece has pre-drilled holes in the back panel for ease of installation; drywall anchors and black screws included for installation! 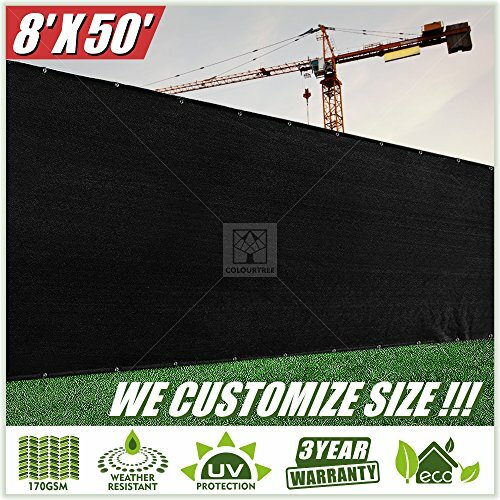 Proudly manufactured and shipped in the USA. Every piece we make is its own creation because reclaimed lumber has natural variations. This uniqueness is one of our strengths and makes every one of our handmade home decor items a one of a kind. Thank you for keeping these unique traits in mind when placing your order! Made from 100% reclaimed wood, this coffee shelf is the perfect addition to your kitchen or coffee bar! With ample space for storing your coffee and tea needs and 4 hooks for coffee mugs, the shelf is full of rustic charm! We use old fence and barn wood to create this original design. Every piece we make is its own creation because reclaimed lumber has natural variations. This uniqueness is one of our strengths and makes every one of our handmade home decor items a one of a kind. Thank you for keeping these unique traits in mind when placing your order! This 3" Wall Filler Pull-out comes with Adjustable shelves and is fully assembled and ready to install in your new cabinet construction. A striking way to display pride in your country, the eagle, olive branch, arrows, and shield on the Natural Color Wall Eagle - 23 in. are all highly detailed and perfectly painted. This wall hanging is crafted in the USA of durable aluminum and features a painstakingly painted finish. There is nothing like a beautifully designed scrapbook. The process of collecting and thoughtfully arranging your carefully curated pieces is truly an art. While many of us have digitized this process by cataloging our ideas on social media sites like Pinterest, Instagram and Tumblr, we still think it’s important to find ways of being creative offline too.Introducing Hangit by UmbraForget the scissors and glue, and present your photos in a space where they can be enjoyed by many. Using the mini “clothespin” clips, attach your photos and mementos across 5 twine cords in a style that is uniquely ‘you'. Hangit is a great gift for all the special people in your life such as friends, family, teachers or students.Instead of hiding your favorite photos and mementos in an album or on your phone, use Hangit to display your personal photo collage as a beautiful wall display in your home, office or dorm room. The versatile design of Hangit is unique in not only shape but also in its function. In addition to photos, Hangit is a great space to hold tickets, awards, children’s art, fabric swatches and more. Hangit is the perfect college dorm room accessory for any modern-day student. Change out images easily to create a new style of dorm décor any time you want. Pin reminders, inspirational quotes or photos from last weekend all in one flexible space.Use Hangit at a wedding ceremony or reception as a seating plan display or a place for guests to write their well wishes. Showcase photos of family, friends or special memories from the past for guests to enjoy during cocktail hour. Did we mention that Polaroid photos fit perfectly across the 5 twine cords? Bring on the celebrations!Order Hangit today and start creating a beautiful wall display using personal mementos and memories.About Umbra: A global product design company providing original, modern, casual, functional, and affordable design for the home. Expo Int'l Tinted Shell Nugget Slate 2/8"
Expo Int'l Chunky Tinted Shell Beads - Slate - 2 x 8"
Expo Int'l Tinted Shell Spike Slate 2x8"
Expo Int'l Tinted Shell Fan Slate 2/8"